Summer is finally hitting Rio Rancho. Tomorrow we are expecting to hit 90. I love it - sunny almost everyday, nice breezes and great views. The pepper plants are producing little baby chilis, we have tomatoes forming, and all attempts at cucumbers and basil have failed. We've planted yet more cucumber seeds - if this set fails, I'm going to the farmers market, buying pickling cucumbers and leaving them in the pots for John to find. John took this photo with the digital camera just out back on the patio. 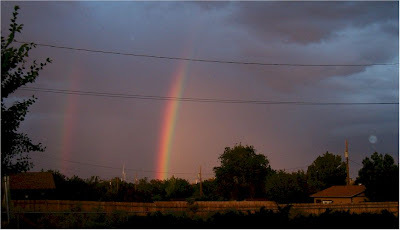 It was an incredibly vibrant double rainbow in an otherwise dark sky. The rainbow was so bright it looked fake. Truly an amazing sight. John and I spend afternoons and weekend mornings in the front garden on the swing. I've filled the garden with succulents, cactuses, Johnny Jump-Ups, 3 different variations of Lavender, Rosemary, Thyme, Strawberry plants and much more. It's really turned into the oasis I'd dreamt of. My silly little collection of bird houses and feeders hang from the large center tree as do my mirror suncatchers and a small set of chimes. Breezes come in, hummingbirds visit my feeders, and otherwise you'd never know you were within throwing range of 3 Wal-Marts. It's a great place to just let the day fall away. The dogs come out and hang out in th garden with us regarless of whether its coffee Sunday morning or beer Friday night. We've purchased two more adirondack chairs for the back patio and replaced a broken backboard on one of the exisiting ones. I need to paint a protective coat on the new ones. They could use a little sanding too. The original ones need sanding too, as well as a fresh coat of paint. I envision painting them in Día de Muertos (Day of the Dead) styling but I question my ability to convert what is in my head to painted furniture. I'm blessed that John allows me to do my wacky painting and decorating. 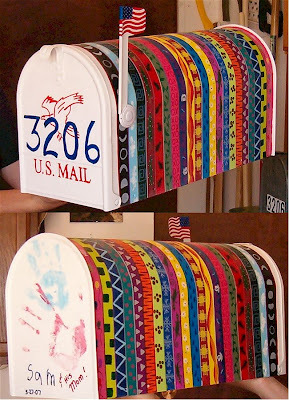 I've recently painted a new mailbox for the house - the old one was small and falling off its post. My new mailbox is large enough for magazines to lay flat on the bottom, and bright enough to eliminate confusion about which driveway is ours. Sam and I put our handprints on the back end of the mailbox and dated it. I've UV protected the whole thing to prevent fade. It will be interesting to see how much just his hand will have grown by the end of the summer. Sam is growing so fast. Kindergarten is over and he's got a summer booked full of trips and vacations. John had him on the 50 riding around in the back yard a week ago. He loved it. 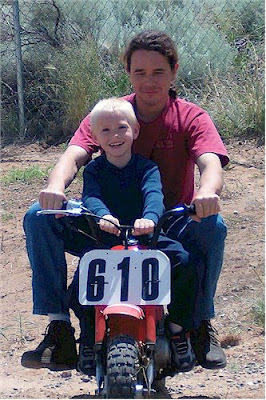 John let him control the throttle for a while - Sam drives like his mom - all or nothing. Afterward, we padded up my helmet to fit Sam and John took him for a short ride around the neighborhood on the back of the XR. Sam did great - he held on tight the whole ride and didn't shift around except to look around. He looked so small on the back of that big dual sport. Sam loved it. I can't wait to get a bike and be able to take him out on rides with us. I've left my job at the cement plant. My businesses were begining to suffer from lack of attention and I'm back to working them full time. I've determined it's time to put everything into my companies and stop messing around with unfulfilling positions in the public. Yes, working for someone else has its benefits, but in the end, I'm doing what makes me happy - I think that is the biggest benefit any job could offer. I'm still actively saving for a motorcycle. More than likely I'll adjust my wishlist and purchase a used bike rather than getting a loan. I'd rather own it outright and crash it, then total something that's not paid for yet.